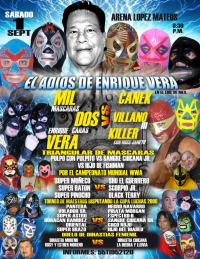 rudos took 2/3. 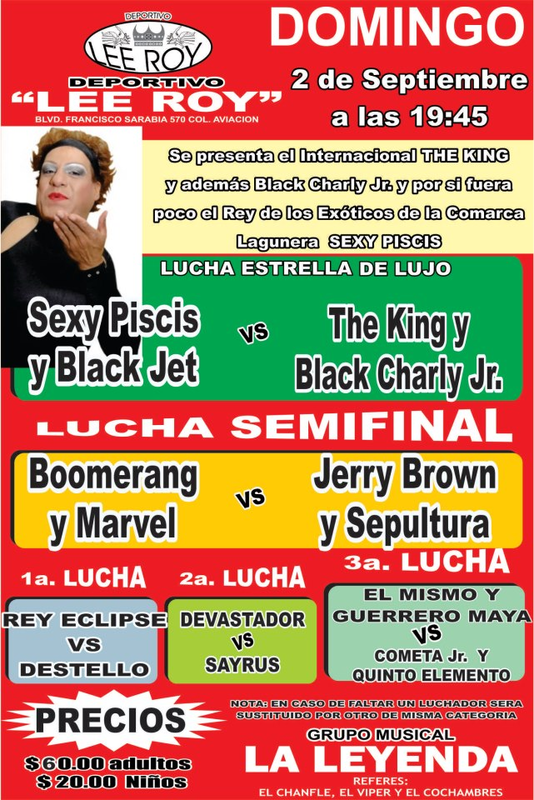 Rey Infierno announced he was going on hiatus, but would come back for Charly Boy's hair. 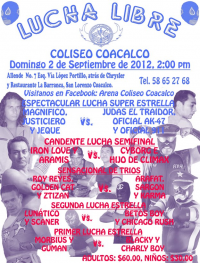 Event Notes: show for the Mano a Mano radio show third anniversary. 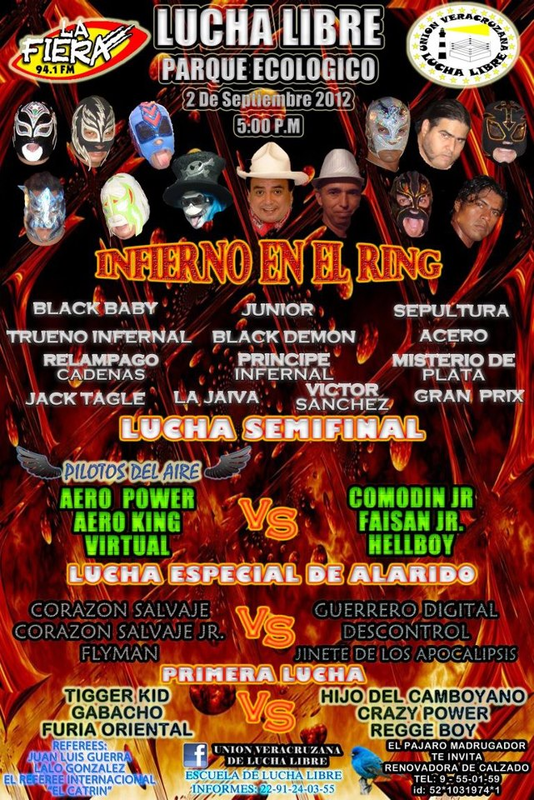 1) Rayo De Plata vs Ray Lee, Aero Boy (California), Gato Infernal, Hades, Trueno, Máscara Solitaria, Xoxo, Monje Maldito, Anestecia, Mentiz, Conde Maldito, Súper Gabacho, Mr. California, ? 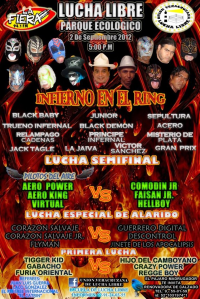 3) Black Thunder, El Hijo del Medico Asesino, Hijo del Dr. Wagner Jr., Rostro Maligno b Magnus, Murano, Skayde, Star Boy Jr.
Medico Asesino & Wagner pulled Magnus' mask to set up the win. 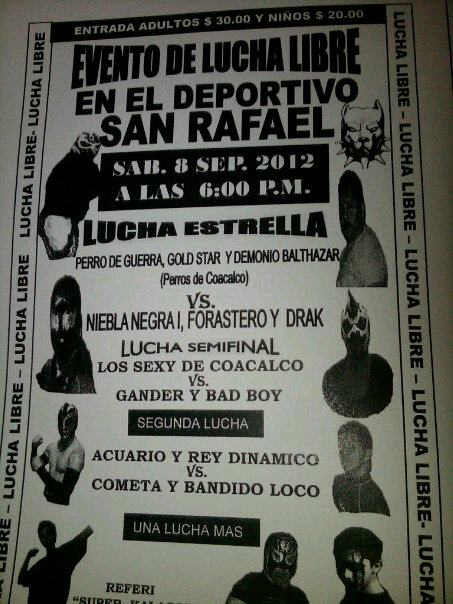 Event Notes: Other wrestlers, including Demus 3:16, Rush, Pimpinela, and Diamante Azul, were at the show. 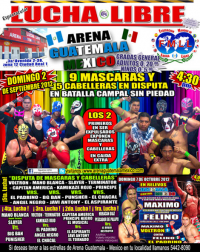 2) Máscara Sagrada Jr. & Rebelde Rojo Jr. vs Kikapoo Jr. & Kung Fu Jr.
2) La Parkita & Mini Lizmark b Piratita Morgan & Piratita Morgan Jr.
3) Exorcista & Guerrero Mixtico b Magnum 44 & Tony Cirio Jr.
match was advertised as Guerrero Mixtico, Tony Cirio Jr. & Skayde vs Black Thunder, Coco Verde and Turbo. Taya Valkyire was advertised but never actually asked to appear. 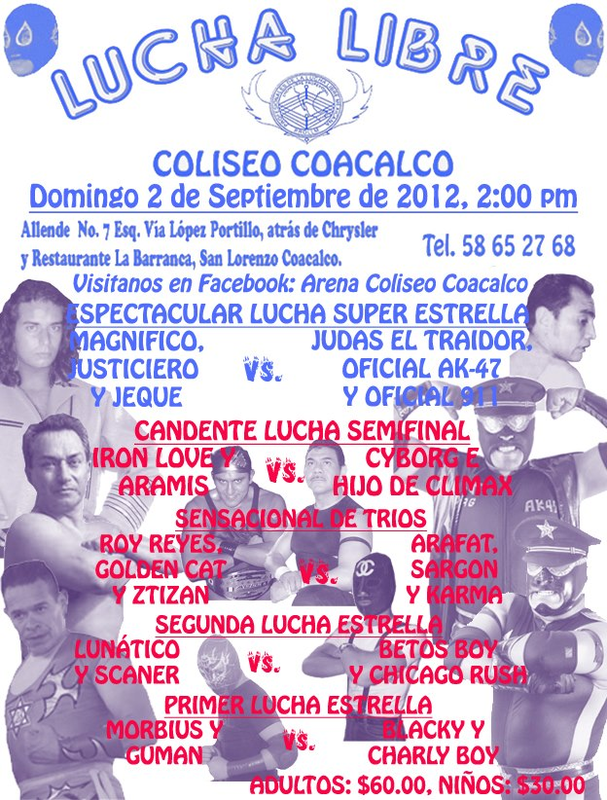 Lili Fighter was also listed as appearing. Cristal took one of their spots. 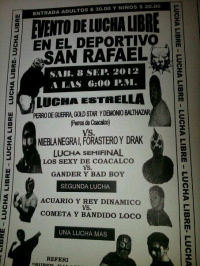 Seeding battle royal where the first four eliminated were out of the match entirely, and the next eight were drawn into the teams. 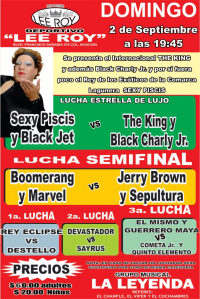 Cibernetico sides were Marcela/Jarochia/Davinha/Black Fury vs Ludark/Casandro/Shitara/Luna. 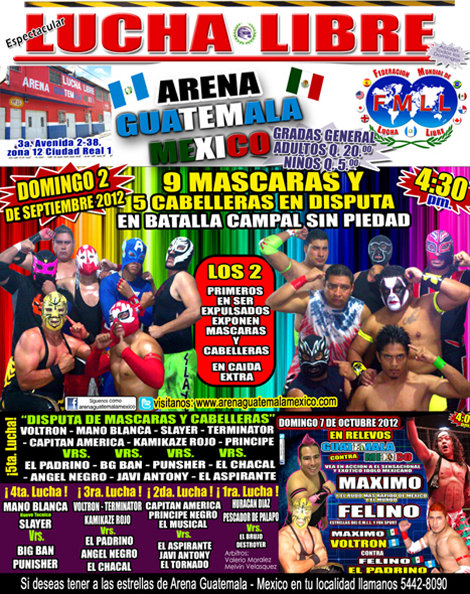 Eliminations went Jarochita, Luna, Black Fury, Shitara, Casandra, Davinha, and Marcela pinned Ludark to win the Copa. Shitara tried attacking Ludark, but Ludark turned the tables on her for her elimination.